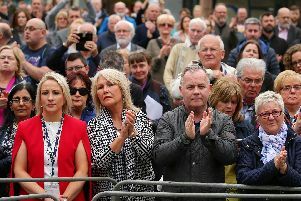 The UUP has said it will have to consult with its ruling council to determine whether it believes anonymity for political donors should end immediately. Whilst its economy spokesman Steve Aiken has told the News Letter that the status quo around party funding means it is hard to shake the suspicion that “something untoward” lies behind the Renewable Heat Incentive (RHI) fiasco, the UUP’s own position on ending donor secrecy is not certain. Uniquely in the UK, whilst donations of £7,500 to parties (or £1,500 to branches or individual politicians) are recorded in Northern Ireland, it is forbidden to publish this information. The DUP has already said in its 2016 manifesto that “the time is now right” to bring Northern Irish law in line with Great Britain. Last Wednesday, the secretary of state announced he is seeking the views of Northern Irish parties on bringing the Province’s law into line with Great Britain on the subject. One day earlier, both the UUP and DUP voted against an Alliance motion at Belfast City Council which called on the secretary of state to lift the secrecy, and for parties to voluntarily publish donor details regardless. When asked if it wants to see an immediate lifting of donor secrecy, and if it would voluntarily publish details of its donors, the UUP said: “We are keen to move to a position of full transparency. The last few weeks have seen suggestions of corruption aired in relation to how the RHI scheme was set up (under the watch of Arlene Foster in 2012), and who may have benefited from it. Mr Aiken said that thanks to donor secrecy “there will always be the sense that there’s something untoward and we can’t get to the bottom of that”. However, he added: “We’ve got no idea whether major energy companies or whatever have actually been supporting political parties. Asked if he would like to see political donations made public right now in Northern Ireland, Mr Aiken said: “We need to have a discussion about it and see where we’re going forward. He added “the DUP should voluntarily tell us if any of their donors are actually involved in the RHI scheme”. The DUP has said it is not within its power to do this, since the Department for the Economy, not the party, hold the list of RHI recipients. The DUP did not directly address the question of whether it would voluntarily publish donations when asked by the News Letter last week, but said it was “clear in its support for the introduction of a donations regime as exists in the rest of the UK”. It added that its political rivals were choosing to promote “baseless innuendo rather than work to resolve the real issues around the RHI scheme”.